Raised in Muncie, Indiana, Small Town Showgirl, Margot Lugosi , was bitten by the burlesque bug in 2013 when she attended her first show, The Star Follies at a local theater. The combination of body positivity, glamour and dance appealed to her. She has been dancing and performing in shows since the age of 3 and is classically trained in Ballet, Pointe, Jazz, Tap, Contemporary, Broadway and Lyrical dance forms. 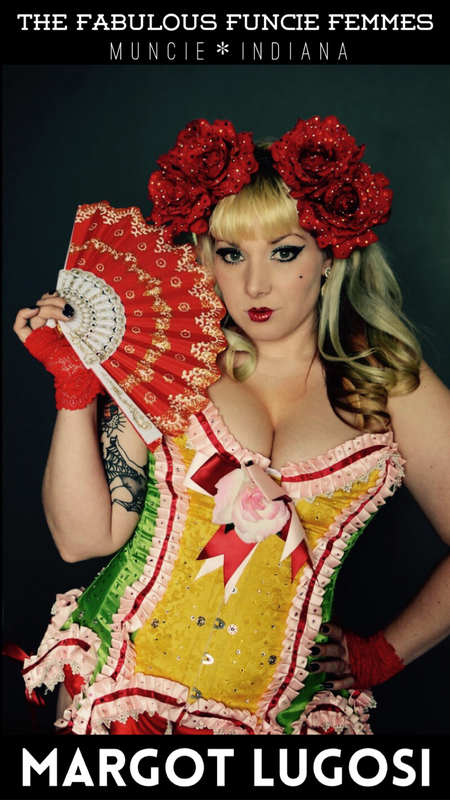 Margot wanted to see more of Burlesque's positive message in her community and in March of 2016 she along with other ladies who has the same vision, created The Fabulous Funcie Femmes. They have been dancing as Muncie's official and only burlesque troupe ever since. Always one for new experiences and challenges, Margot has been heating up stages all over Indiana as well as working on new and unusual burlesque projects, such as the Rocky Horror Picture a benefit for Cornerstone Center for the Arts, Hot Rods for Hunger a benefit for the Second Harvest Food Bank, and also bring Burlesque to the stage for East Central Indiana's biggest haunted House, Scarevania. Margot teaches a popular burlesque toning and Retro-A-Gogo class every week at her yoga and dance studio, Studio Exhale. In her muggle life, Margot works as an artist and costume designer in the Haunt and Horror Industry, which helps her give expert advice on all things costuming in her Drab to Fab: Costuming for Burlesque Workshop.